Revealbot’s ads automation is a pretty flexible tool that enables you to optimise your ad campaigns the way you want. This article showcases some of the unusual tasks that you might find use for. The first one is pretty straightforward. Duplicate task will create a copy of an ad set that meets your conditions. Define the frequency of duplication and what you want to do with the original ad set when the rule is triggered. With these settings the rule may be triggered no more than once a day and if it is, it'll keep the original ad set active. The other option would be to pause the original. Let's say you want to do something with the ad sets, which performance is getting worse. In this example I take the Cost Per Purchase and compare its value for the last 3 days with the value for the last 7 days multiplied by 1.2. In other words, I want to check if the Cost Per Purchase in the last 3 days is 20% bigger than the Cost in the last 7 days. The second condition ensures that an ad set was created earlier than 7 days ago. If the conditions match the rule will decrease the budget of an ad set by 20%. Note that if in the last 7 days there wasn't any purchase, the rule wouldn't act. If the ad set brought you some purchases, say, 5 days ago, but none for the last 3 days, the rule wouldn't be triggered as well. Basically this rule will pause an ad set, that has too little Add to Cart to Link Clicks ratio, the threshold here is 18%. If on 100 Link Clicks you get only 17 or less Add to Cart events and if the other two conditions are met, the rule will be triggered and will stop the ad set. So what we did here is set the condition on the custom conversion using metric comparison. Let's consider some other ideas that may come in handy. Say, you'd like to automatically set budgets for each day of the week, cause some days might be more fruitful. It can be done by a single rule with multiple tasks and a custom schedule. Each task covers different days and sets different budget value. This task will set the budget at $50 on Monday, Tuesday and Wednesday. 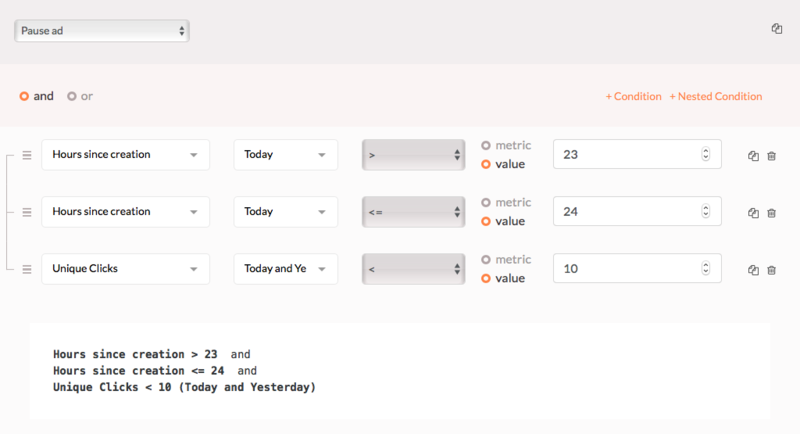 Then you add more tasks with different budgets and days in the same rule. That's it! 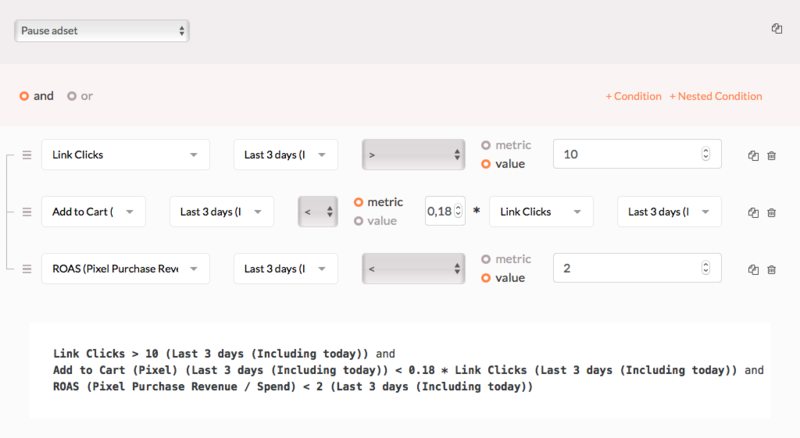 This rule would automatically manage the budget of your ad sets through the whole week. See how to control your ads in the early stages of their lifetime in the next section. You can set several tasks for different points of an ad's lifetime and alter the conditions in each of them. Make the rule check conditions every 30 minutes and you're all set. Note that even if the chosen timeframe of a metric covers a period starting before the moment the ad was created, the metric would be calculated correctly anyway. So in the example above it would be okay to use even last 7 days (including today) time window for the Unique Clicks. Found that helpful? Try it yourself!